Freshman center Kayla Mokwuah shoots during Sunday's home game against Saint Joseph's. Women’s basketball scored the fewest points it has in more than a month in a contest against Saint Joesph’s Sunday. Despite having more success in Atlantic 10 play than the No. 10 Hawks (8–15, 4–6 A-10), the Colonials (8–16, 5–6 A-10) fell 41–38 in a game plagued by turnovers and inconsistent offense. The upset marks the fourth consecutive loss for GW. The Colonials’ offense was stagnant for the majority of the game, scoring only four points in the first quarter and never recording more than 14 points in a frame. They shot 31.3 percent on the day on a 15-for-48 clip. 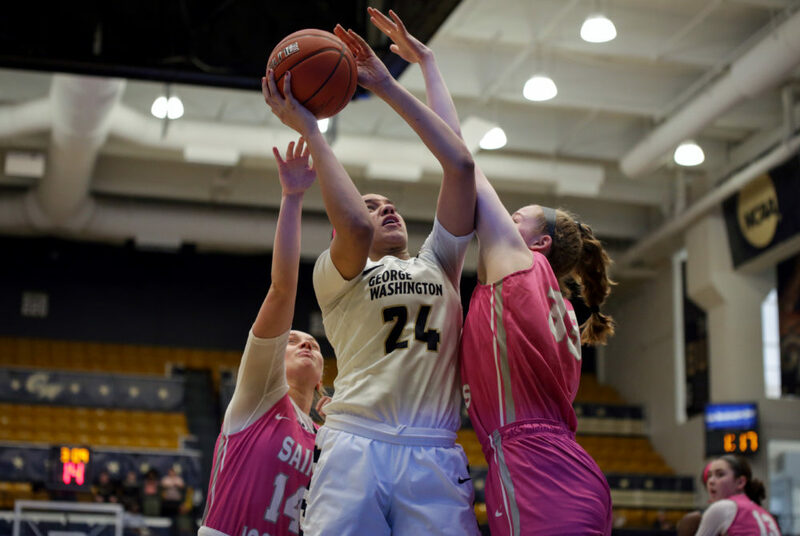 The small offensive success the Colonials did have – largely provided by freshman center Kayla Mokwuah and redshirt sophomore forward Olivia Gumbs, who scored 16 points and nine points, respectively – was undone by careless ball handling. GW tallied 19 turnovers during the outing. 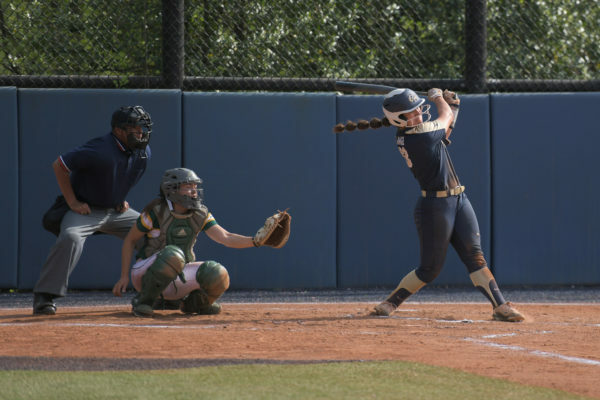 In the final frame, the Colonials put themselves back in the game by outscoring Saint Joseph’s 14–9. But their comeback was thwarted by costly defensive mistakes and missed opportunities. Senior guard Mei-Lyn Bautista, Gumbs and Mokwuah all missed crucial layups, and GW committed four turnovers in the final 10 minutes of play. The contest got off to a slow start for both teams, with just one basket apiece in the first eight minutes of play. But the Hawks picked up the pace toward the end of the frame, knocking down three consecutive triples – including a buzzer-beating basket by senior guard Alyssa Monaghan – to pull ahead of the Colonials 11–4 by the end of the first quarter. In the same span, GW shot 2-for-12 from the floor. In the second quarter, redshirt sophomore forward Sarah Overcash left the game after appearing to injure her left leg in play. But she was able to walk off the court with assistance and later returned to play in the third quarter. The second frame saw the Colonials pick up on offense, going 6-for-12 from the field and outscoring the Hawks 14–9 to head into the locker room down trailing 20–18. After the break, a layup off an offensive rebound from Mokwuah gave the Colonials their first lead of the game. Mokwuah’s 16 points led the floor on the day, but six turnovers marred the freshman’s efforts. GW’s lead was short-lived. Mokwuah’s basket was the Colonials’ lone field goal of the third quarter in which GW went 1-for-13 from the floor. The Hawks went on an unanswered 10-point run to head into the final frame up 32–24. A quick triple from Bautista to open the fourth quarter sparked a 7–0 run that put the Colonials within one point of Saint Joseph’s with 7:47 left before the final buzzer. But the Hawks answered with an 8–2 run of their own bookended by triples from sophomore guard Mary Sheehan, who led Saint Joseph’s with 14 points on the day, to grow their lead back to five points 40–35 with three minutes to play. A free throw and a layup by Gumbs and Mokwuah put the Colonials within two points of the lead, but a free throw by Monaghan kept the game just out of GW’s reach. The Colonials have a weeklong break before returning to action Sunday at noon to host Dayton.